Though Anurag Kashyap and Vikramaditya Motwane's Netflix series, based on Vikram Chandra's 2006 book, gets many details right – like the fundamental examination of the healing and destructive powers of religion – the sense of being untethered, which is so elemental to the book, is largely missing from the series. A life dependent on the accuracy of a gunshot does not provide too many options. That ultimate binary of life and death spawns different pairs: saint or sinner, perpetrator or victim, local or outsider. In a world where rulebooks are written, revised, and burned, where anything can be straightened or distorted, Ganesh Gaitonde, the feared Mumbai don, is struggling to answer who he is: a gangster or a god? From Ganesh’s viewpoint, this question is not facile – it has coiled snakelike in his mind and stung him repeatedly. The similarities are several: like the almighty, he is feared and worshipped, omnipotent and brave. But more importantly, Gaitonde has a quality central to all gangsters (and gods): People are willing to kill and die for him. Vikram Chandra’s 2006 novel Sacred Games revelled in its binaries. They were evident in the book’s world – the tussle between cops and gangsters, gangsters and politicians, gangsters and gangsters – and also in its structure: like a sturdy tree, the book grew both inwards and outwards, encompassing the feverish accelerating present, suffocating any scope for pause, with an uneasy confused past threatening to break its barriers. They were also evident in the use of language: Bombay’s street argot back thumping Chandra’s prose, bridging the gap between ‘elegance’ and crass, the kind of book where “love is a murdering gaandu” sits not too far from “Kamble was quite indifferent to the degeneration-of-India gambit”. Equally important, that binary was hard coded in the storytelling – alternating between Gaitonde and his nemesis, Sartaj Singh, a cop trying to emulate his virtuous father – asking uncomfortable questions of the readers. Whose story were we more captivated by and more sympathetic towards? What does that say about us? The novel, brimming with cinematic potential, has finally found a home in a Netflix series directed by Anurag Kashyap and Vikramaditya Motwane. The approach to adaption here (by writers Smita Singh, Vasant Nath, and Varun Grover) isn’t literal. At more than 900 pages, the novel is a literary behemoth, packing sharp details, myriad subplots, and intricate character motivations. The web series, thankfully, isn’t trying to tame the sun; it’s a much leaner, condensed version of its source, trying to locate the novel’s moral and philosophical centre. It is a commendable, much-needed approach, yet one that, at least initially, seems to be in a needless hurry. Unlike the novel, which linked its plots and themes carefully and intelligently, the web series dumps motifs. It clarifies its intentions quickly – the fundamental examination of healing and destructive powers of religion – but through a spate of on-the-nose dialogues (“sometimes I feel I’m the god”, “god talks to us through stories”) that is more interested in reinforcing a logline, a way to think about the series itself, than first finding its rhythm and telling a story. A major part of the book is Gaitonde telling his story in first person, but that choice, through an all-revealing voiceover, doesn’t translate that well on screen. Even the character of Sartaj Singh (Saif Ali Khan) is seen through a quasi-melodramatic lens, flattened to evoke pathos. Unlike the book, the series’ Sartaj is an obviously dejected figure: hooked on to anxiety pills, bullied by his boss, locked in a profession offering little growth (his last big catch, according to the swirling gossip in the police station, was Sonu the pickpocket). That isn’t helped by the fact that the series, unlike the novel, overtly begins like a genre piece, replete with a 25 day-countdown signalling doom’s day. Even in these portions, the series doesn’t markedly depart from the book, but you do miss its casual diversions, its varying pace, its complete sense – like watching a long distance runner stopping to catch her breath. The series’ first few episodes are, in contrast, too taut for their own good, obsessively focused on maintaining a sharp narrative, hurtling from one plot point to the other. The sense of being untethered – so essential, so elemental to the book – is largely missing from the series. All of this is a little surprising because Kashyap — the master of mining humour in horror, the film nerd who understands the bond between cinema and gangsters (a motif present in the novel, too) – is perfect for something like this. Chandra’s Sacred Games is not just a vast sweep of the organised crime in Mumbai; its heart beats for the micro, the moments in which people are silly, goofy, stupid, capturing in terrifying precision the absurdities and mundaneness, joys and fear, of being a gun-toting ‘chutiya’. The series finds its essence when it starts digging deep into the minds of characters, showing us their different sides, prodding us to make sense of their worlds and, ultimately, themselves. Katekar (Jitendra Joshi), for instance, a constable, is introduced as a loyal subordinate to Sartaj, an honest cop who has worked hard to attain a one-room house for his family. Yet the same Katekar is also an Islamophobe, intolerant of Bangladeshi immigrants in the city. As Katekar is deriding them in front of Sartaj, you wonder about the power dynamics of the scene. Katekar’s boss, a Sikh, much like the Bangladeshi immigrants under fire, is in the minority, too – someone whose community was once ravaged by a similar populist anger. And yet they share an amicable relationship marked by mutual respect. 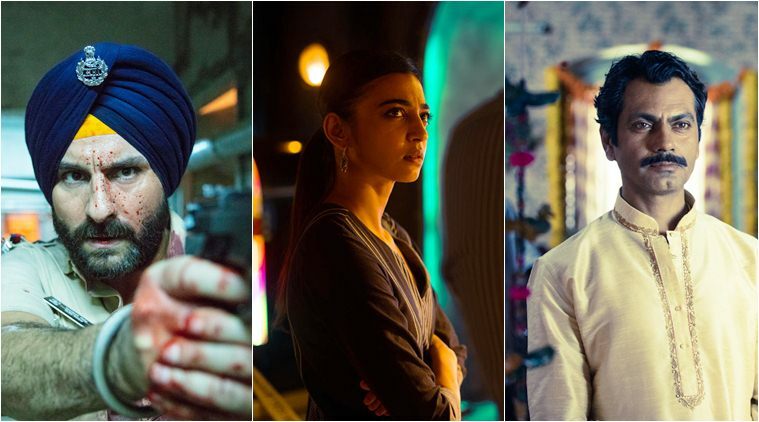 Saif Ali Khan, Radhika Apte and Nawaazuddin Siddiqui in stills from the Netflix show. Sacred Games is always alert to small moments like these where well-meaning individuals lose to themselves, showing the multiplicity of human life and the dangerous assumptions of slotting people. (In a subsequent episode, Katekar interrogates a Bangladeshi woman whose son is a suspect. She talks about him joining a computer class, but Katekar doesn’t believe her. However, when she presents the brochure of the said class, he is rendered ashamed: his son has enrolled in the same institute). Similarly, Anjali Mathur (Radhika Apte), a dedicated RAW officer, is on a mission to save Mumbai, and yet her compassion doesn’t extend to Sartaj’s informer. But the series reserves its fury, its most powerful moments, for sequences interrogating the genesis and meanings of religious fundamentalism in the country – a debate that has only intensified in the recent years. In Sacred Games, religion is a buffet that consumes all: personal stories, histories, politics, the sense of self and, most importantly, masculinity. Gaitonde (Nawaazuddin Siddiqui), in both the book and the series, often questions his identity. The answer, almost always proffered by someone else, is religion: We’re defined by our dislikes. But Gaitonde’s definition of hatred and violence is different; it’s either personal or professional, never communal. In a stunning indictment of middle-class India, Sacred Games presents a gangster who, in many ways, is better than a politician or an ordinary citizen. By doing so, the series also shows the religion’s true demonic power – its ability to swallow and vomit someone like Gaitonde, an inbetweener stranded between “us” and “them”. Because if Gaitonde is neither “us” nor “them”, then who is he? The writing, which gradually picks and sustains momentum, steers clear from straight answers, but is always planting doubts in our minds. It’s not easy to wholeheartedly like or dislike a character here; people’s traits lie on a spectrum – shifting, expanding, shrinking. What’s also wonderful here is the use of time. Several plot threads (such as the post mortem analysis of Gaitonde’s underling or Anjali on a time leash to crack the case), introduced at various points, are referenced later, showing that the series is in sync with itself — a mark of confident storytelling. The actors, too, help Kashyap and Motwane. We all know that Sidiqui can play a Gaitonde with ease, but the real revelation here is Khan who never tries to overpower a scene, entering and exiting it with smooth elegance. There’s also a strong sense of karmic justice throughout the series. We get what we deserve, implies the show, evidenced in the fates of different characters, but another question lurking not far away is, how should we define an innocent? When our lives have been rigged by the biggest collective drug, then where should we start and where should we end? Sacred Games is, above all, about the game itself, where the individuals don’t matter, the apparatus does — the machinery luring our subhuman instincts. And history has shown, in different parts of the world, that it’s not that difficult. A push here, a shove there, one fake WhatsApp forward, and a grievous sense of being wronged is all that it takes. “How could it happen?” “How could we let it happen?” are questions that we love to ask about the past, glossing over our present. Sacred Games probes the mechanics of a peculiar Indian insanity and lays bare our hypocrisies. Complaining is futile; enduring is mandatory. “We keep saying that there’s no place for an honest man in this city, this country. But who makes the system?” Sartaj asks Katekar at one point. “Who makes Mumbai? Who makes India?” Katekar keeps looking at Sartaj, trying not to answer questions he’s all too familiar with. Then he pours himself another drink.